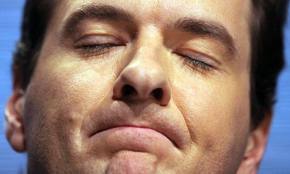 Osborne’s statement to parliament on recent economic volatility was pervaded by inaccuracy, complacency and vainglory. It was only appropriate that during the rioting of recent days, meditations on the crises within the global economy were made to take a momentary backseat both in term of political and media focus. For those inclined to wonder what a Chancellor gets up to on holiday, Monday’s Daily Telegraph article offered a fascinating insight and an interesting overture to his speech today. Where most tourists in Los Angeles write home with postcards, Osborne, it seems, writes home with Telegraph articles. Then, Osborne’s article was pervaded by inaccuracy, complacency and vainglory. Today, his statement to the Commons continued along much the same lines. The reality? Osborne and team have been largely reticent throughout the American and eurozone crises of recent weeks. Such crowing would normally infer that recovery in the UK was firmly back on track. That despite growth stagnating at 0.2% during the previous quarter. That despite manufacturing output falling 0.4% between May–June. And yesterday, the Bank of England downgraded the UK growth forecast for the fifth time since Osborne took office. Paul Krugman, the American economist, recently compared the ratio of employment to population at three stages – June 2007, June 2009 and June 2011 – to indicate that job growth is non-existent in the US. If a similar analysis is applied to the UK economy, the conclusions to be drawn are equally grim. In June 2007, 74.4% of adults of working age were in employment. But as of June 2011, under Osborne’s watch, the same figure stood at 70.7%. Given that the global economy is so inextricably entwined, collapse, whether in America or the eurozone, would have inevitable repercussions on the UK. China’s unprecedented intervention during the American debt crisis, for instance, was not a mark of its seemingly inevitable ascendancy into the world’s new economic superpower; not the act of one nation offering prudent advice to its less economically-sound counterpart. Rather, it was a statement of its own anxiety; the recognition that, with some $3tn-plus of US dollar reserves, its own economy would be impacted by a US meltdown. Osborne’s assertion that the UK is a safe-haven represents a deep misunderstanding of the impending risk of contagion. The very same rating agency that downgraded the United States has taken Britain off the negative watch that we inherited and reaffirmed our AAA status. For Osborne to find vindication in the S&P decision was a staggering misjudgement. As a recent US Treasury factsheet underlined, S&P are far from infallible. The shrewd response of John Bellows, Acting Assistant Secretary for Economic Policy, highlighted a $2tn miscalculation in its forecast for American debt to GDP. Despite acknowledging this error, S&P upheld its original decision. Bellows described the S&P rationale as driven by political motivation, rather than economic astuteness. Following today’s statement, as the Chancellor continues to peddle his tiresome recovery delusion, the same allegation must be levied at the Government’s flailing fiscal policy. Couldn’t agree more; Osborne is living in complete denial as to the impact of his cuts on the economy. God, are you stupid or something? I thought this was evidence based blogging, rathrer than pure rhetoric. German CDS has only jsut squeezed under UK CDS today, but traditionally Germany has been seen as much safer. So not really on Osbourne’s watch then, is it? And Whilst S+P are most definately fallible, they are correct in saying the US is basically bankrupt already. Socail security accounts for apporx 90% of Federal tax revenues. It’s simply not sustainable. But the CDS market is where people really price risk – ratings agencies are usually reactionary – and CDS says that the austerity measures and move to balanced budgets in the UK is helping keep rates low in the UK. Whilst the UK will suffer in a Eurozone crisis, it won’t be our debt which blows up in yield like Italian and Spanish bonds. Try extending deficit spending forever as many on the Left, let alone Ed Balls, want to do, and the markets will simply crush Gilts. Pension funds are lining up to pump the ECB with their crappy EU debt at the moment, and the ECB is quickly running out of bullets. Osbourne is completely correct that fiscal responsibility in the UK is preventing the same happening to UK Gilts.